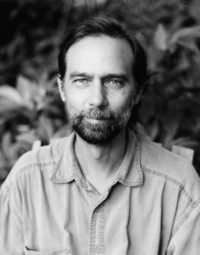 Today I have an interview with Charles de Lint, an award-winning Canadian sci-fi and fantasy author with many books to his name. 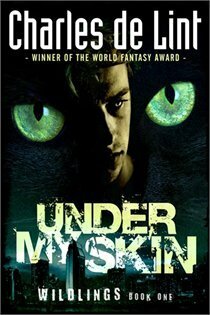 His latest book is Under My Skin (Wildings #1), the first book in a new YA shape-shifting series. When I start a novel I take into consideration the various settings, the characters’ interests and backgrounds. In the case of Under My Skin I had to brush up on life in Southern California as it’s been awhile since I’ve been there. The same goes for some of the research on surfing, skateboarding, gang life, etc. But my life-long interest in mythology, folk tales and fairy tales naturally infuses much of what I write without my having to research those aspects. The trick to good research is to make it a general habit to pay attention to as many and varied sources of information as you can—whether for a book that you’re already working on, or as source material for a future story. A broad information base gives you a springboard for characters and plotlines and all sorts of things that you can then delve into when you’re beginning a story or looking for a good character. And really, if we’re not already interested in other people and cultures, why are we writing in the first place? Writers traditionally don’t get very much input into what goes on the cover of their books. In this case, I was shown the cover design at various points in the process but all the final decisions rested with the publisher. I can’t choose favourites—that’s like asking which of your children you like the best. You’ve written long and short stories, YA, children and adult stories, series and stand alone books. Do you have a preference for the type of story you write? I generally like to mix it up between writing for adults and younger readers. The only thing I can say with any certainty is that, as a fulltime author, I wouldn’t want to only write one sort of story for one particular audience over the course of my career. When it comes to length, I also like to mix it up. Short stories are fun because I can experiment with style and form—if it doesn’t work out, I’ve only lost a week or two of work. Do that with a novel and I could lose a year. I’ve had great feedback on my short stories from my readers throughout my career, and have had 18 collections published so far so I’m pretty proud of that. But as fun as short stories are, I have to admit that I like the comfort of a novel—knowing where I’ll be for the next year, and the company I’ll be keeping. It’s great getting to know my characters over a long period of time, and it’s always hard to let them go when a novel ends. For the Wildlings series, I’ll get to hang out with these characters over the course of three books, so I’m enjoying that—except for having to put them through some very difficult situations. I spend so much time with them that they feel like my real friends. How has being a book reviewer affected your writing? A lot of books show up for review in my P.O. box and I try to be fair with them, especially when the author is unfamiliar. I only review the books that I like, because I’m not interested in spending my time reading something that doesn’t appeal to me. So I try a book and see how I like it. If I find myself bored—be it after a few pages, a few chapters, whatever—I set it aside and go on to the next. Reading is subjective. What makes me stop might be my own boredom with what’s on the page, bad writing, implausible storyline, characters I don’t care about. Reviewing books keeps the awareness of what not to do foremost in my mind when working on my own fiction. Naturally, great books inspire me to push harder as I write. My first goal with any story is to write something that has me wanting to know what happens next. So long as I’m excited with how the story’s going, then it’s a success as far as I’m concerned. The real work begins in my rewrites and that’s when what I’ve learned from other books, and my own writing, helps me the most. Thanks for interviewing me for Workaday Reads. I hope your subscribers will come and visit me at www.charlesdelint.com. I’m also on Facebook, Twitter and MySpace. Thanks for much for being here. Charles is also available on Goodreads. Josh Saunders has seen the news reports, but he is still unprepared when it happens to him. One minute he’s arguing with his mother’s boyfriend and the next, he is looming over the man, blood dripping from his claws—he has transformed into a mountain lion. When he switches back to his human body, he knows his life has changed forever. He has become a Wildling. Trusting only his best friends Des and Marina with his secret, Josh tries to return to regular living. But an encounter with Elzie, another Wildling, brings him unwanted attention from the authorities. And when an accidental betrayal reveals Josh’s secret, his carefully constructed cover is ripped apart, forcing his friends to intervene. They must grudgingly put their trust in others, including other Wildlings—and, most challenging, in each other—if they ever hope to save him.